Halfway through Gears of War 3, I realized that a Lancer assault rifle would be a very effective tool for keeping the raccoons out of my garbage can. It all made sense. Then I realized that the technology doesn’t exist, and more problematic, PETA wouldn’t be too happy about it. So I moved on, and I purchased a raccoon-proof garbage can instead. I still wanted a Lancer gun, though. 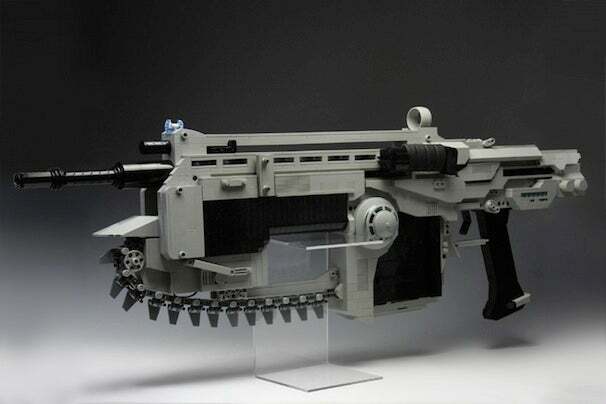 And as of today, it looks like I may just be able to build a life-sized Lancer Assault Rifle out of Lego bricks, complete with a motorized chain saw and magazine release. The Lancer Assault Rifle, created by 'Plum B' over at MOCpages, clearly shows just how badass legos can still be. The Lancer fires rubber bands from magazines and pretty much makes your neighbor’s six shooter rubber band gun look like something a child would take to a gun fight. Imagine how many kids you could scare off just using the chainsaw around town. This raises yelling "get off my lawn!" to a whole new level. Darn kids. Also, neighborhood raccoons, you’re officially on notice.